Recently a major life insurance company contracted me to develop a set of Behavior Models to aid in their search marketing efforts. The results enabled them to make major changes to their website’s ability to capture active consumer searches. Providing editorial focus for websites. Identifying preferred terminology for ads. Normalizing your website with consumer intent. 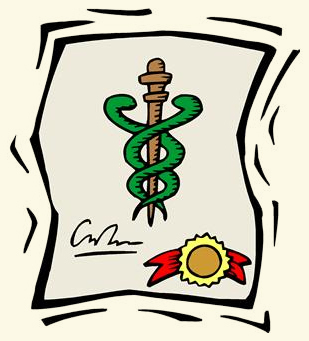 Drawing consumers with active intent to your website. 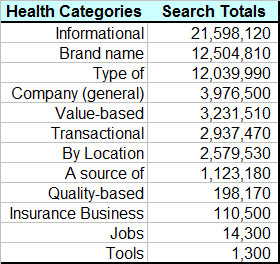 The following table list the categories of behavior (with monthly search volume) in health insurance. Many of these provide custom landing page opportunities to capture customers before they view your competitor’s site. It gets better. If you look at sub-categories of behavior, you find some very interesting targeting opportunities. A category often has specific terms being used that can provide editorial focus for page copy for custom landing pages. 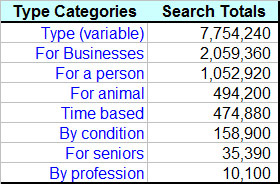 In the following table, the categories of search by a “type” of insurance or a “class” of individuals are good landing page examples. PS. Here’s an example of a full search behavior analysis in a related medical discipline: How consumers search for Lasik Services.